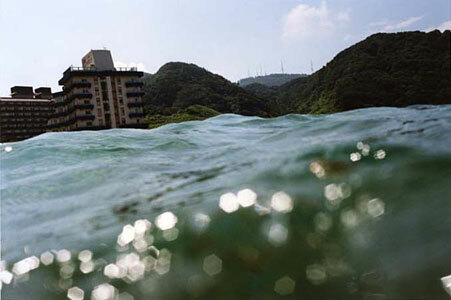 Yossi Milo Gallery is pleased to announce an exhibition of color photographs by Asako Narahashi. The exhibition will open on Thursday, July 17 and close on Friday, August 22, with a reception for the artist on Thursday, July 17 from 6:00 to 8:00 pm. This will be the artist's first solo show in the United States. Asako Narahashi's series half awake and half asleep in the water is a collection of C-Prints of various coastal sites in Japan. Since beginning the project in 2001, the artist has photographed over fifty locations with a Nikonos 35mm waterproof film camera. Narahashi floats chest deep in the ocean while facing back towards the shore, her camera held half-submerged in the water. By watching the waves without using the viewfinder, the artist times her pictures according to the swells of the ocean tide. From this vantage point, waves washing against the lens of the camera create unexpected relationships between water, land and sky. With the water in the extreme foreground, the ocean dominates the view and distorts the customary perspectives of bridges, airplanes, buildings and mountains. The images are suspended in moments of uncertainty, leaving conflicting sensations of calm and growing apprehension unresolved. Asako Narahashi was born in 1959 in Tokyo, Japan. She began experimenting with photography in the mid-1980s. Work from this series is included in the current exhibition Heavy Light: Recent Photography and Video from Japan at the International Center of Photography, New York. Her photographs are held in the permanent collections of the San Francisco Museum of Modern Art; the Museum of Fine Arts, Houston; National Museum of Modern Art, Tokyo, and the Tokyo Metropolitan Museum of Photography. Asako Narahashi currently lives and works in Tokyo.